Yesterday we got rid of some of our electronic waste. Interior Alaska Green Star has an annual recycling program so that all this stuff can get disposed of properly instead of winding up in the landfill, or on it's way to third world countries. Andrea volunteered at yesterday's event and dumped off two of our old computers, three CRT monitors, a printer, a VCR, cordless telephone, DVD player and a CD player. The total cost was $75. Some of the people who showed up didn't know there was a charge, and at least one guy who wound up leaving said, "Why should I pay when it's free to go across the street and throw it in the dumpster?" I have no doubt that's where his electronic waste wound up; on it's way to the landfill, right next to the Tanana River. According to the Wikipedia article, e-waste represents only 2% of the garbage in our landfills, but is responsible for 70% of overall toxic waste. That's a pretty big externality, totally unrepresented in the low cost of these items. 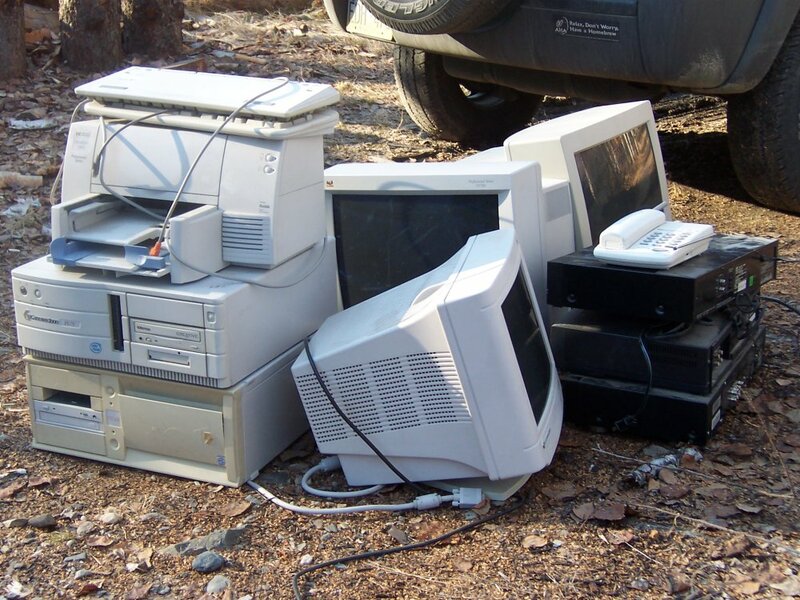 I'm glad these recycling programs exist, but I also wish there was a way to encourage electronics manufacturers to make products that were designed for longevity rather than low cost. Some of the things we got rid of were simply obsolete (why keep a seperate CD player when our current combination VCR & DVD player can also play CDs? ), but the majority were broken and because replacements are so cheap, it didn't make sense to repair them. All those low prices we're paying for our stuff today may turn into a pretty big cleanup bill in the future, whether we're paying it or not. Last weekend we decided to upgrade the coil elements on the stove that came with our house (the ugly yellow thing in the photo). We went to the Borg, looked at the replacement options and decided we'd better make sure we knew what sort of elements we had before buying anything. We tried to look up our stove at GE's website, but our model number didn't show up. I took apart one of the burners to see what the element looked like (pre-1992, hinged) and we went back, this time to Lowe's (they're across the street from one another, if you can believe it). Nothing matched. So we drove across the street to Home Depot. Nothing matched. Tired of trying to figure it out, and in keeping with the 21st century culture of consumerism, we gave up and decided to buy a new range. It's one of those fancy electrics with the ceramic-glass top and large elements that can be set to more than one size to fit the cookware you're using. The one we chose has two single-size 7 inch burners in the back, one large 12 / 9 inch burner in the front, and next to it, a 10 / 6 inch burner. Lots of variety, and more importantly, two large burners up front. With our previous stove, it was impossible to cook an omelette and bacon at the same time, and even on the largest burner on the old stove (8 inch), I had to move the bacon around continually to keep it in the hot zone at the middle of my twelve inch cast iron pan. This weekend was my first attempt at cooking bacon and eggs at the same time. 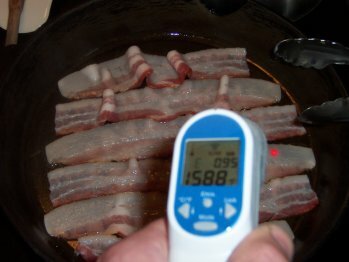 I cooked bacon on the large burner in my large pan, and the burner heated the entire surface of the pan to the same temperature. No more hot spot in the middle, and the improved output and coverage resulted in perfect bacon. 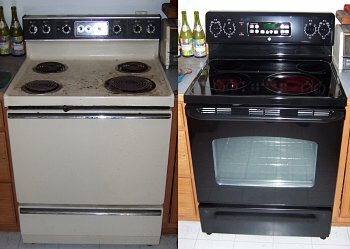 Without all the movement and cold spots, it cooked in half the time as on our old stove. 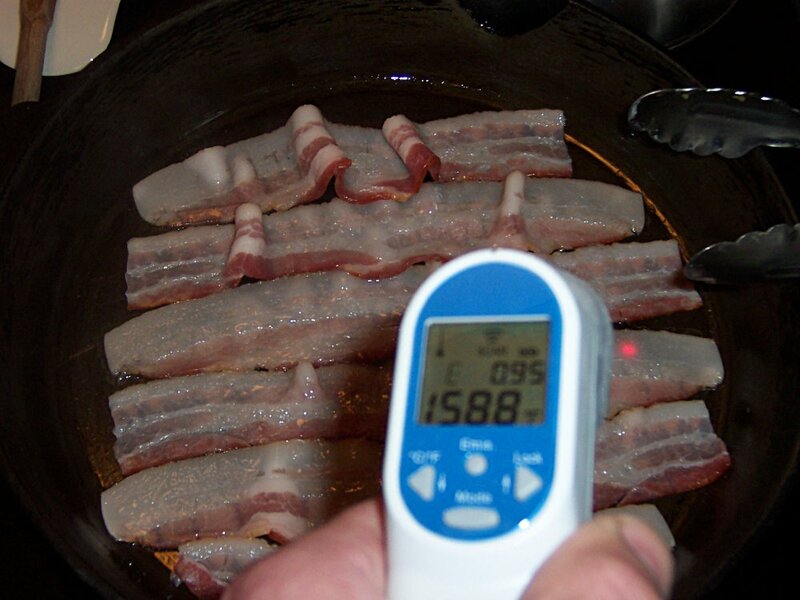 The lower image on the right shows the bacon cooking evenly, and an IR temperature reading from the edge of the pan. Best of all, I cooked an omelette on the other front burner in my smaller ten inch cast iron pan. I haven't baked bread in it yet, so I don't know how the oven will compare to our old one, but I can't imagine it could be worse. The smaller elements that sit inside the larger coils on the two front burners are a little weaker than I'd like, and as a result, it takes longer to boil water in our kettle than on the old stove. And the elements aren't variable; they're either on or off, so they're always clicking on and off at lower temperature settings, which is a little strange. But all in all, I'm really liking it. Someday we'll get a dual fuel, gas cooktop and electric oven, but for now, I'm happy with what we've got. We've had Koidern almost a year now, but as much as she loves being in the house, she's never felt comfortable enough to sleep on the dog beds we made. When she first came, she'd pace around and finally lie on the rug in front of the couch. 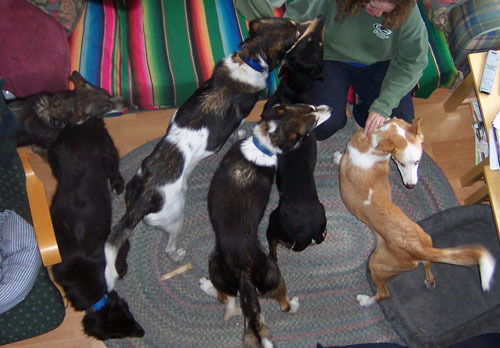 A few months later, she started sleeping on a small commercial dog bed away from the other dogs. Within the last few weeks, her favorite spot has been the stair landing. 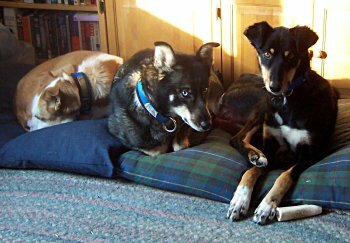 But today, when I came home from work to let Piper and Nika out (it's been too cold outside for them to ride with me to work), Koidern came in and went right for the middle dog bed, traditionally Kiva's bed. Kiva stood above her and gave her the stink eye, trying to get her to move but finally gave up and curled up right next to her. Getting a new dog integrated into the family is a challenging and stressful process, and I think this marks Koidern's full membership in pack Swingley. I have a friend whose house1 burned down a few years ago. He and I are both baseball fans and I'd lent him my copy of Robert K. Adair's The Physics of Baseball before the fire. I never saw the book again, and wasn't going to bother him with such an inconsequential item when he was trying to replace all the really important things he lost. I've since replaced it with a newer edition and he's now living in his new house. Since that happened, I've worried about what I'd be able to replace if we had a disaster, mostly because I wouldn't be able to remember everything. Normally, I suppose, you'd make a long list of the stuff you own, file it with your insurance company or put it someplace safe. But there's a much faster way: just take a digital picture of everything, burn it all to a CD or DVD and file that away. 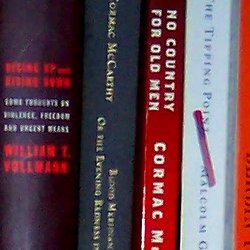 We've got a reasonably inexpensive 3.1 Megapixel camera, and I just took a couple photos of one of my bookshelves. The book titles were too hard to resolve when I took the entire bookshelf with one shot, but you can easily read everything at full resolution when only a couple shelves are fit into the frame (that's what the image above is a sample of). A few minutes with a camera and I'll have a nice record of all of it. 1 Google as an English language expert: I couldn't remember whether this phrase was "who's house" or "whose house". A google search for the first phrase yielded 76.7 thousand hits. 'whose house' is almost ten times more popular (737 thousand), so I figure that must be correct. To confirm this, I repeated the search, adding 'site:http://www.nytimes.com' to the search string. Two hundred and ninety-five hits for 'whose house' at the New York Times, zero for "who's house". Case closed. Also: the new version of Firefox will spell check text entries like the big textarea I'm typing this post into. Goes a long way toward eliminating spelling mistakes in blog posts. Check it out! We got a new dog named Koidern today. She had problems with other dogs in her previous kennel, so we're hoping that she does better here. So far so good, but we're still in the early phases of the introduction. From left to right in the photo, there's Kiva, Nika, Buddy, Deuce, Koidern and Piper. Andrea is on the couch petting as many as she can get her hands on. Koidern will be four in June and she's one-quarter saluki.